You’ve had your in-ground trampoline for a while now and you’re wondering, “What kind of in-ground trampoline accessories should we get?” We have a suggestion that will be not only useful but functional as well. A simple organizational unit will keep shoes and other items coralled and is an ideal way to store personal effects when you’re having a workout or jumping on your in-ground trampoline. What is this “miracle” accessory? Shoe bags! You can purchase shoe bags and if you have a net around your in-ground trampoline the shoe bags can hang from there. If you don’t want to impact the sightlines of your beautifully landscaped yard by having an in-ground trampoline fence, then you can hang the shoe bags off a nearby tree or they can be placed on your outdoor furniture. They are ideal for storing items (not just shoes!) If you have shoe bags you can put in shoes and you can even store your trampoline socks and shoes. You can put your cell phone there, a bottle of water, towel or other items that you have with you when you’re out of doors. Look for shoe bags that are all weather and are mesh. If you leave the shoe bags out of doors you don’t want it to become home to rain and moisture as that can lead to hoardes of mosquitoes and mold. Look for a shoe bag that is compatible with your in-ground trampoline or look for one that will easily hang from a nearby tree, your swimming pool fence, in-ground trampoline net or on a lawn chair. They are light and portable enough that you can bring them in and out with you every time you’re on the trampoline. Look for shoe bags that are easy to install and hang and that are washing machine safe. Because the shoe bags will be outside, they are bound to get dirty and dusty and even muddy. Look for shoe bags that make it simple to empty out and toss in the washer. You can hang the shoe bag back outside in the sun to dry and it’s ready to use again. If you are the proud owner of an in-ground trampoline you know it’s fun for rebounding for both fun and exercise. Have you ever wondered what other things you can use your in-ground trampoline for? We have some unique ideas for in-ground trampoline owners. Using an in-ground trampoline in other, unique ways to use it that you may never have thought of — but we have! 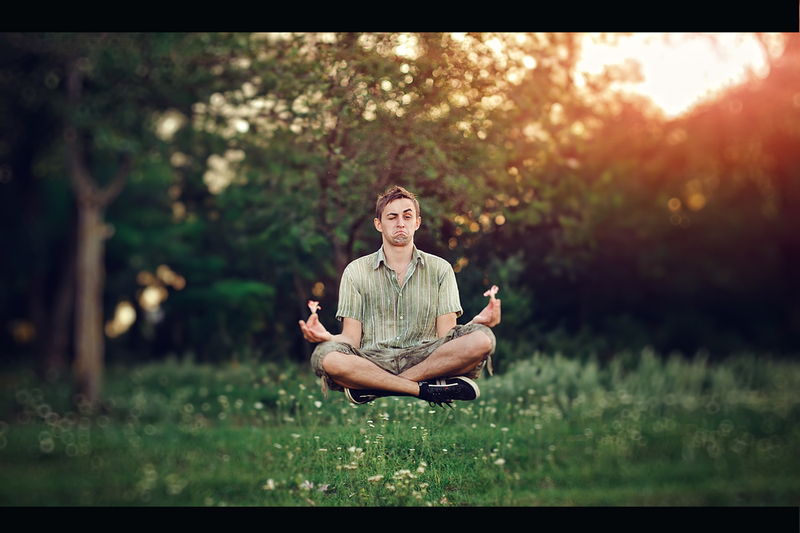 Meditating out of doors is a way to get in touch with nature and to take your meditation practices to a new location. If you have an in-ground trampoline you can settle yourself into the middle of it and meditate in comfort. Let’s face it, sitting on the ground can be uncomfortable and bad on the back, but sitting on an in-ground trampoline takes away any stress on your joints and makes your meditation practice even more relaxing when you’re not shifting around because you’re uncomfortable. Campolining. What is campolining you may wonder! We’ve heard it’s one of the latest and greatest ways to enjoy your in-ground trampoline. It’s when you camp and sleep on the in-ground trampoline! Hence, campolining! Sleeping on an in-ground trampoline is a way for children to sleep outside and not have to sleep on the ground. It’s also a way for adults to lie together under the stars and enjoy the quiet beauty of the night sky. If your in-ground trampoline is large enough, you could even sleep outside on it with your children or your significant other. We’ve heard from some of our in-ground trampoline customers that they are investing in colorful pop up tents they are placing on the in-ground trampoline to cover themselves up at night when they are sleeping. It’s a great way to enjoy the out of doors with a bit of protection from any bugs or other critters! If your children don’t want to sleep outside at night (or if you don’t want to have to sleep outside at night with them!) consider letting them nap outside in the afternoon. It’s a great way to let them get some fresh air, you can relax and read a book or do yardwork while they’re sleeping and it will just be plain fun! NOTE: If you’re considering setting a tent on your in-ground trampoline, give us a call or send us an email first so we can help you make certain it will not damage your in-ground trampoline. Why is an in-ground trampoline better and safer? It reduces height injury, looks more appealing in your yard and provides great bounce. If you have children in your house, it simply makes sense that if they’re jumping on a trampoline that is ground level, they won’t have the additional height of an above ground trampoline, coupled with their jump and the potential of hitting the ground and injuring themselves. Safety matters. 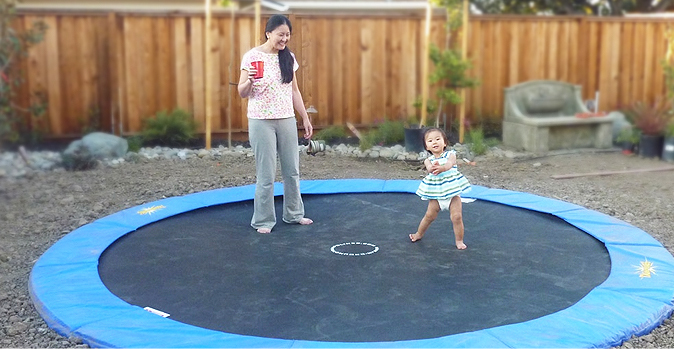 An in-ground trampoline is safer because of its lack of height. The distance between the ground and the jumper is reduced. Of course, injury can still happen — just as it could if you’re walking down a sidewalk or using any other piece of sports equipment, but height injuries are less likely. An above ground trampoline injury has the potential for injury in addition to the height, can happen when children and animals crawl beneath the trampoline when someone is jumping on it. This risk is completely eliminated with an in-ground trampoline. An in-ground trampoline is safer than any above ground trampoline mainly because we use made in the USA products and make certain no pieces of metal are exposed. Your IGT system comes with a spring pad cover that is designed to protect jumpers from landing on a metal spring or the retaining wall. The in-ground trampoline pad covers the lip of the trampoline retaining wall and adds an additional few inches of protection. Additional safety measures for your in-ground trampoline can be purchased from us in the form of a safety net adapter kit. This is installed on the retaining walls and allows for a safety net enclosure to be added. Aesthetics matter. An in ground trampoline is attractive. Your view will not be obstructed by the unsightly frame of an above ground trampoline and its sky high net. With an in-ground trampoline your backyard sightlines and landscaping will not be impacted by the new in-ground trampoline system. Performance matters. Our customers have chosen an in-ground trampoline purchase from our company because of the high quality of the system we provide. Whether you’re using your in-ground trampoline for gymnastics, cheerleading, karate or for a fun way to get in shape, the IGT system delivers. The pad we supply with all of our in-ground trampolines are specifically designed for airflow in the trampoline pit to escape between the pad and the springs. Our IGT trampolines come with the highest spring counts of any comparable size trampoline, 96 springs for a 12’ and 120 springs for a 15’. The springs of a trampoline are like the engine of a car, that’s where you get all your bounce power! The 8 ½ inch, American made, pre galvanized springs are guaranteed to deliver in both bounce and durability. We know our in-ground trampolines are the best and that we deliver for our customers every time. We know that when they are rebounding — whether for fun or exercise or both — they are going to be safe and jumping on a beautiful device. Exercising on a trampoline is considered an ideal way for adults (and children) to exercise. Why? Because when you jump on a trampoline you are experiencing a bout of weightlessness at the top of the jump and when you hit the bottom of the mat you’re experiencing about 4G of force on the mat. BUT even when you land, you’re not putting any stress or strain on your joints or muscles because the soft jump mat is taking away the force of the impact and cushioning your landing. Here are five other ways trampoline exercise is great for your body. It’s a fun way to lose weight and stay fit. Fun? Exercise? In the same sentence? It’s true! A study performed by NASA found that a 150-pound person who spent an hour on an in-ground trampoline burned more calories than that same person would if he was jogging! Rebounding supports your metabolism and that helps you lose weight. Rebounding at a moderate pace gets you moving and doesn’t stress your metabolism. If you rebound at a moderate intensity three or four times a week you are on your way to fitness! You will increase your lymphatic flow. Moving toxins in and out of your body keeps your lymphatic system functioning healthier. A healthy lymphatic system rids your body of unwanted waste and unhealthy toxins. When you jump on the in-ground trampoline you are getting a whole body workout. And this increases your lymphatic flow. Detoxification benefits from jumping. When you are rebounding you are getting a unique form of exercise that allows you to be in a momentary weightless state. The force of gravity when you land benefits all of your muscles, cells and lymphatic system. If you’re looking for detoxification benefits, jump for just fifteen minutes a day. Improve your immune system. A healthy and strong immune system will help you ward off colds, the flu and other infections and illnesses. Again, the increase in flow through the lymphatic system boosts your immune system because you’re removing toxins and that might keep you healthier. Cellulite be gone! Rebounding on an in-ground trampoline is like “pumping” your body. When you pump your body you are seeing positive benefits on your thyroid gland. Rebounding is a way to stimulate your thyroid and helps it clean itself of stored fat. This stored fat is cellulite. It’s been proven that rebounding will help eliminate cellulite and who doesn’t want that?! There are myriad benefits to rebounding and when you add in that it’s just plain fun, is there any reason you’re not using an in-ground trampoline every day?